20 new alien cultures are now racing towards the site of the conflict. They each want to carve out their own piece of the galaxy for themselves. Over the coming weeks, we will be revealing the aliens that may be familiar to some of you (reprints of past favorites) and unveiling aliens no one has ever seen before. The first on our list is a blast from the past; the Sniveler! 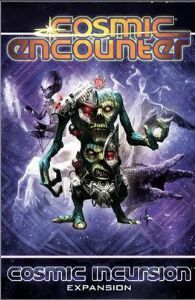 In addition we will reveal the newest additions to the Cosmic Encounter universe. From the game-changing Cosmic Quakes to the bounties held within the Reward deck, these additions are sure to spice up your quest for galactic dominance.